TP Trailers & Truck Equipment serves businesses and municipalities as the headquarters for steel and aluminum truck bodies. However, when our customers require a unique solution, our custom truck up-fitters go to work. We do all our custom fabrication in-house at our Limerick, PA location. 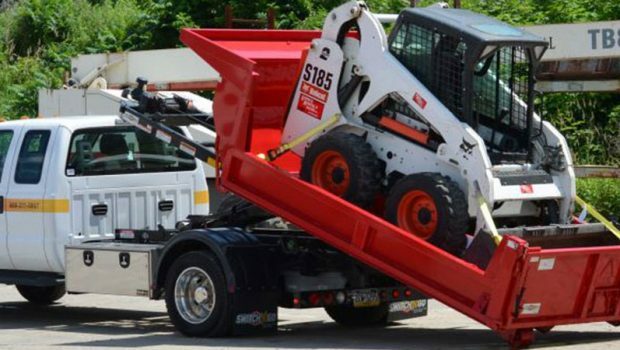 With years of experience servicing a wide range of clients in a variety of industries, our truck equipment department boasts quite the portfolio. See some of the unique bodies we’ve built to meet our customers’ needs — and learn what we can do for you. This truck body was designed as a do-it-all piece for this customer. 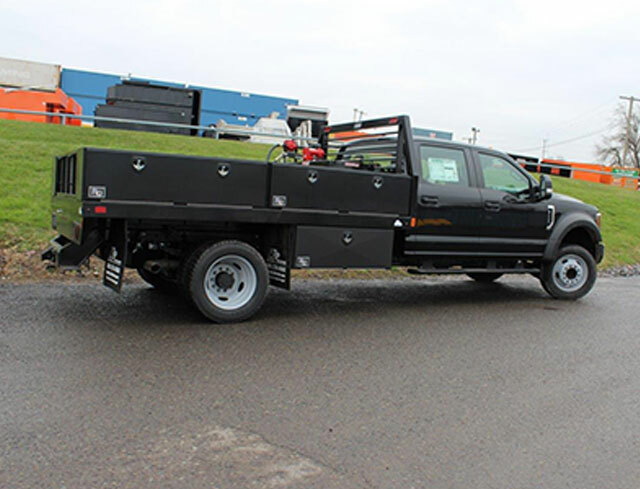 While great truck bodies with contractor toolboxes are a-dime-a-dozen, this body stands out due to the fuel transfer tank attached to the platform body. The fuel tank allows the team to conveniently refuel diesel equipment in the field, while providing general equipment maintenance. In addition to the main side toolboxes, this body also has an underbody toolbox for extra storage. Plus, we added a custom tailgate onto the body to provide better airflow, which can help with fuel mileage. The TP Trailers & Truck Equipment truck body up-fitting team created this Swiss-army knife body to service wastewater pump stations. 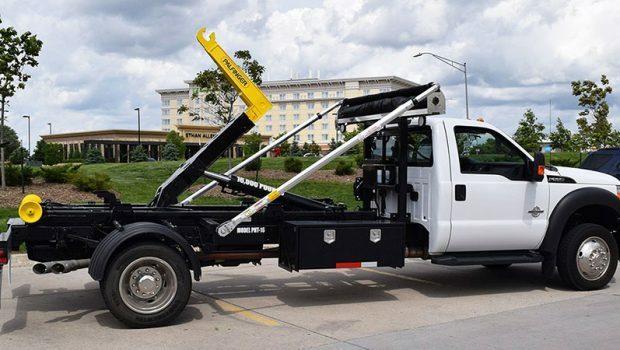 The main feature of the truck body is the crane attached to the aluminum flatbed — the crane is useful for pulling pumps from both dry and wet well environments. In addition to that, this aluminum body features a fuel transfer tank and a water tank with a pump sprayer, which is used to clean the equipment at any site. 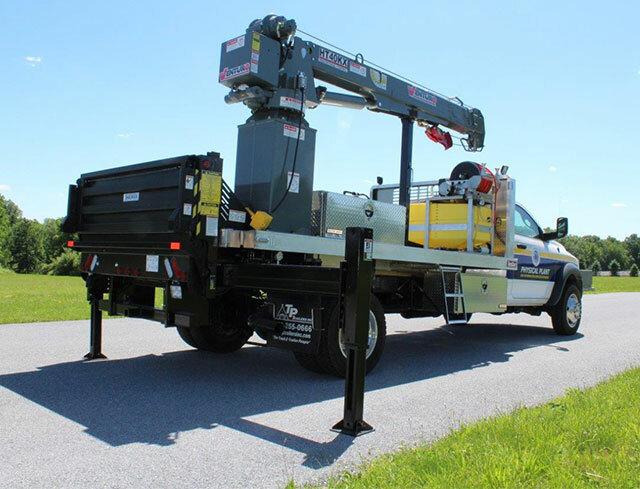 Finally, this truck also features a custom lift gate for lifting multiple types of equipment. 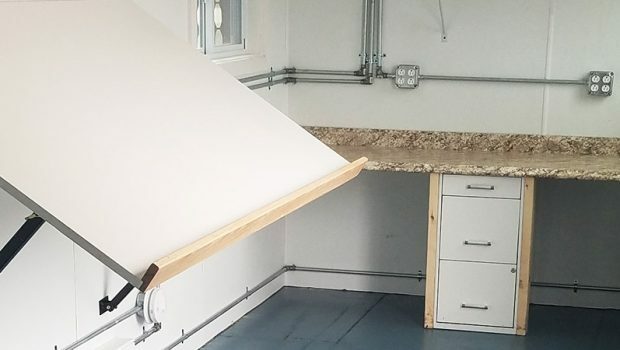 While most of the custom up-fitting work we perform is meant to create unique solutions for our clients, sometimes our custom bodies are a cost-saving measure. This truck body is a perfect example of that. This landscaper already owned an aluminum dump body, but also needed a chipper top truck for tree trimming. Rather than buy a whole new chipper body, they upgraded the equipment they already had. Our custom up-fit body performed both functions easily — and allowed the company to save on equipment. In addition, we added a custom side door extension to allow the door to be open while the dump body was engaged. This custom fabrication done on this RAM 5500 was designed to allow our client to pull a car hauler from their pickup truck. The fifth wheel hitch we up-fitted onto their pickup allows for a whopping 30,000 lbs of towing capacity. Another way our custom manufacturing proved helpful is that the fifth wheel hitch was built to a custom height to match the car trailer. TP Trailers’ truck equipment department is the destination for all things trucks and heavy equipment. If you need a standard aluminum or steel truck body, we offer a wide selection from some of the most respected names in the industry. We can match the truck body to your needs and your budget. Learn more about aluminum truck bodies vs steel truck bodies. 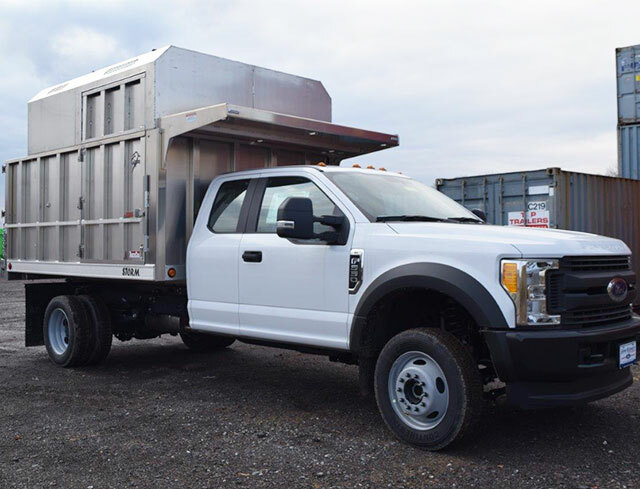 Our custom up-fitting shop builds unique truck bodies, either steel or aluminum, for a variety of contractors, businesses, and municipalities. Whether you want something similar to one of these custom truck bodies, or you want something totally different, contact us. Plus, for all of those custom bodies, we have the ability to color match our work to your truck. Start the conversation and get your custom truck body quote today. "Quick service, very helpful, they got the truck up and running. Pleasant atmosphere. Thanks for your help! Ed was great and knows his stuff and Jane was polite and very helpful."